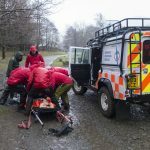 Incident Details: When the snow falls, Sharp Edge becomes a very serious proposition, so when this job came in, the Team’s first vehicle was away very quickly indeed, and a large number of Team members turned out for what might well become an epic. A group of two, including a dog, got cragfast after one of the party turned his ankle on the snow-covered ridge, and rang for assistance. The “getting stuck” might have had something to do with not having an ice axe or crampons to tackle the conditions. 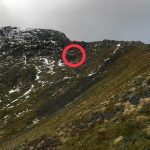 However, a passing climber was good enough to assist them all to the top of Foule Crag, so the Team was actually stood down after 12 minutes, for which we were duly grateful. It goes without saying that even if the snow is minimal and slushy in the valley, anywhere above 300m is a completely different proposition, and full winter equipment is essential. This group were lucky – others might not be. 18 Team members – 22 minutes.